We feel that worship is the natural response to God’s love for us. In a corporate sense, we gather to celebrate that love and give it back through our worship of the Lord Almighty . 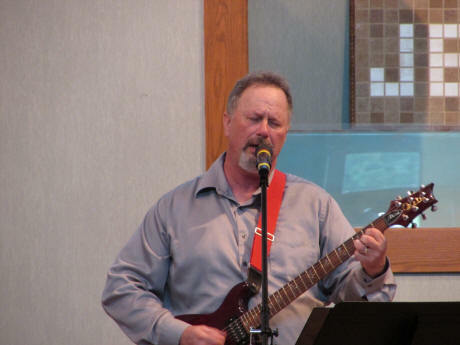 There are many different styles and ways that we can do that and that is why we offer two distinctly different worship services (Traditional and Contemporary). The main goal of the worship experience in both services is that you come away knowing you’ve encountered the Living God. Child care and children’s Sunday school is offered during both of these services. This service concentrates on the reverence of God. We sing great hymns of the faith from our hymnals accompanied by a pipe organ. Pastor Kevin presents the Word in a relevant, easily to understand way that allows you to apply it to your life experience. This service is geared more to the relational aspect of God. We are led by our praise team, which consists of drums, bass, acoustic guitar, electric guitar, keyboard, violin and 3 vocalists. We sing current, recognizable praise and worship songs as well as hymns that have been “revamped” for a more current sound. Pastor Kevin brings us relevant, Biblical Truths that are presented with various types of multimedia. The King’s Kids Children’s Choir meets September through April on Sunday evenings from 5:30-7:00 pm. The activities each Sunday evening include music rehearsal, a devotion, a game or craft, and snack. Children, ages kindergarten through sixth grade, are invited to join us. The children learn music that we sing for our congregation twice a month in the contemporary service at 11:00 am. One of the highlights each year of each year is our Christmas Nativity pageant where we present the Christmas story through a child’s eyes with narration, costumes, and song.